Antoine François, comte de Fourcroy (15 June 1755 – 16 December 1809) was a French chemist and a contemporary of Antoine Lavoisier. Fourcroy collaborated with Lavoisier, Guyton de Morveau, and Claude Berthollet on the Méthode de nomenclature chimique, a work that helped standardize chemical nomenclature. Fourcroy was born in Paris, the son of an apothecary in the household of the Duke of Orléans. On the advice of the anatomist Félix Vicq-d'Azyr (1748–1794) he took up medical studies, and after many difficulties caused by lack of means he finally obtained his doctor's diploma in 1780. Fourcroy's attention was turned specifically to chemistry by J. B. M. Bucquet (1746–1780), the professor of chemistry at the Medical School of Paris. 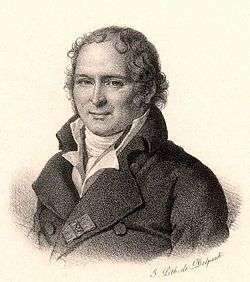 In 1784 Fourcroy was chosen to succeed P. J. Macquer (1718–1784) as lecturer in chemistry at the college of the Jardin du Roi, where his lectures attained great popularity. Last work published by Foucroy before his death, the "Système des connaissances chimiques et de leurs applications aux phénomènes de la nature et de l'art", 1801. Fourcroy was one of the earliest converts to the views of Lavoisier, which he helped to make widely known by his own voluminous writings. The Royal Society's Catalogue of Scientific Papers enumerates fifty-nine memoirs by Fourcroy alone, and fifty-eight written with others, mostly Louis Nicolas Vauquelin. Fourcroy's 1785 publication, Entomologia Parisiensis, sive, Catalogus insectorum quae in agro Parisiensi reperiuntur ..., co-written with Étienne Louis Geoffroy, was a major contribution to systematic entomology. Although Fourcroy's name appears on a large number of chemical and also physiological and pathological memoirs, he was as much a teacher and an organizer as an original investigator. While a member of the committees for public instruction and public safety, and later, under Napoleon I, director-general of instruction, Fourcroy took a leading part in the establishment of schools for both primary and secondary education, scientific studies being especially provided for. In 1801, Fourcroy was elected a foreign member of the Royal Swedish Academy of Sciences. On December 16, 1809, the very day on which he died in Paris, Fourcroy was created a count of the French empire. He is buried in the Père-Lachaise Cemetery in Paris. 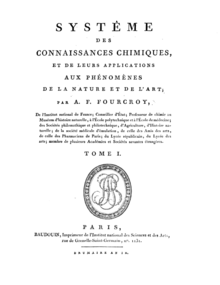 Antoine-François de Fourcroy’s 1787 publication entitled Méthode de Nomenclature Chimique, published with colleagues Antoine Lavoisier, Claude Louis Berthollet, and Louis Bernard Guyton de Morveau, was honored by a Citation for Chemical Breakthrough Award from the Division of History of Chemistry of the American Chemical Society, presented at the Académie des Sciences (Paris) in 2015. It is believed that Cape Fourcroy, at the western tip of Bathurst Island, Northern Territory, Australia, is named after Fourcroy. The cape was named during Baudin's expedition to Australia, and it is known that Baudin had a copy of one of Fourcroy's texts with him on the Géographe. ↑ "The Discovery and Exploration of Australia". australiaoncd.com.au. Retrieved 25 October 2010.